Chocolate brownies, chocolate chips, chocolate bars, oh my!! It would be highly unusual for me to turn down chocolate at anytime. Unfortunately, despite my enthusiasm for chocolate, I never share this delicious treat with my pet. No, it’s not because I am selfish, but because it is toxic and potentially dangerous. How can something so delicious be toxic to our pets you ask? 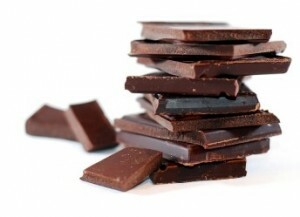 Chocolate contains an ingredient called theobromine that humans can easily metabolize (lucky us! ), but dogs and cats are not as fortunate. 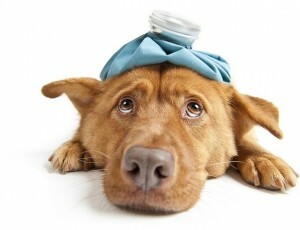 When your dog or cat ingests theobromine, it is processed much slower, allowing it to accumulate to toxic levels. The hazard level of chocolate depends mainly on the level of theobromine and the size of your dog. Signs of poisoning such as vomiting and/or diarrhea can be seen with levels as low as 20 mg/kg; levels over 40 mg/kg results in toxic effects to the heart leading to hyperactivity, an irregular or racing heart rate; and lastly, levels over 60 mg/kg result in poisoning to the nervous system including muscle tremors, seizures and in some cases death. 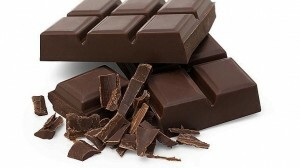 As a general rule the darker the chocolate, the higher the toxic level. For example, white chocolate and milk chocolate contain a lower level of theobromine compared to dark chocolate, cocoa or baker’s chocolate. A large dog that consumes some milk chocolate may develop vomiting and/or diarrhea, or no clinical signs at all, however, if that same dog were to consume a small amount of 60% dark chocolate they could be at risk of seizures and/or death. Smaller dogs are usually at higher risk for toxicity compared to large breed dogs. Another indirect complication associated with chocolate ingestion includes intestinal blockages. Most pets, when consuming chocolate do not bother unwrapping the chocolate, thus consume wrappers, and other packaging materials that can become lodged in their intestines. Lastly, depending on the chocolate treat consumed, your pet may also be at risk for developing pancreatitis (inflammation of the pancreas) due to higher fat content of some of the treats. This usually manifests several days later and can lead to vomiting, diarrhea, nausea, decreased appetite, and/or abdominal pain. My dog just ate chocolate, now what?! The best thing to do would be call your veterinarian. Make sure you have your pet’s body weight, and if possible the exact amount of chocolate consumed. 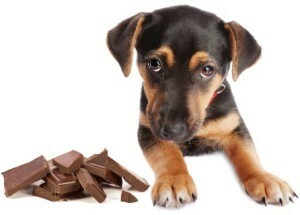 Your vet can do a calculation to determine the toxicity of the amount of chocolate ingested. If the level is below toxic dose, your vet may advise that treatment is not necessary. You can now spend time with your dog as he or she sits there smiling smugly with chocolate breath, or you can choose to give them the cold shoulder for getting into your personal supply of chocolate. If it is determined that the chocolate level is toxic, or you do not know the amount of chocolate consumed, it is best to bring your pet to the vet immediately. If your pet has consumed chocolate within the past few hours, your vet can administer a medication to cause your dog to vomit. Depending on the amount of chocolate, your vet may also offer activated charcoal to your pet to prevent further absorption of any remaining chocolate in the stomach. If it has been longer than a few hours, or if your pet is now demonstrating the signs of chocolate toxicity (see above), then your vet will recommend hospitalizing your pet for supportive care. 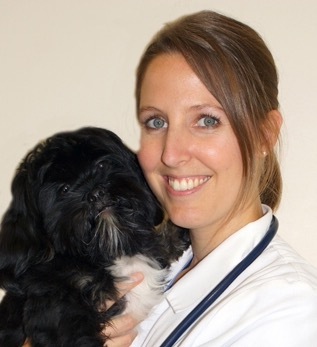 Depending on the clinical signs your pet is exhibiting, this may include intravenous fluids to help dilute/flush out the toxin, medication to treat tremors, seizures, and/or heart rate abnormalities. 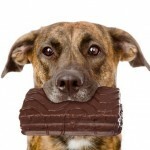 Although chocolate toxicity can happen at anytime, it occurs more commonly around the holidays, Easter, Christmas, Halloween, Valentine’s Day, so make sure you keep your chocolate in a safe place that your pet cannot access. After all, prevention is the best medicine!